While many would argue that a moderate approach to fat loss is always best, there are clear situations where rapid fat loss is either needed or simply desired. Research also suggests that a faster initial fat loss leads to better long-term results. The Rapid Fat Loss Handbook is a scientific approach to quick weight loss that generates a 4-7 lb. fat loss and 11-20 lbs. of weight loss in only 2 weeks. See below for format descriptions. The Rapid Fat Loss Handbook offers a scientifically based approach to quick weight and fat loss. Recognizing that people need or simply want to lose weight and fat rapidly, I set out to develop the safest, most effective way of accomplishing that goal. I based the program around the idea of creating a diet that would provide the fewest calories possible while still providing all of the essential nutrients required by the body: protein, essential fatty acids, vitamins and minerals. This provides simply the safest and sanest way to lose fat quickly without sacrificing health (or muscle mass). Every aspect about how to set up the diet is laid out in a step by step form and the diet is based around whole foods that can be found at any market. With purchase of the book, you’ll also receive instructions for how to access an online calculator that will set up the diet and provide food recommendations. As well, the diet also incorporates concepts I’ve discussed on this site: free meals, refeeds and full diet breaks to help with both adherence and the body’s tendency to fight back when dieting. Guidelines are provided for when to take them, how to use them, etc. In addition, guidelines for moving back to maintenance, as well as for using the program to transition into a more moderate fat loss diet are provided in detail. Specific training guidelines are also provided in order to provide the best results with the least time investment. Massive amounts of exercise aren’t needed; quite in fact, too much exercise while on the rapid fat loss program can hinder results. Quite in fact, for the extremely overweight, no exercise is actually required to reap the benefits of the program. The book provides specific recommendations (for everyone from beginners to advanced trainees) for both resistance training and aerobic activity in terms of how often and how much will provide the best results. As well, realizing that most people can’t or won’t join a gym, I developed a small home-exercise handbook outlining a basic routine that can be followed with no or minimal equipment. This is included with your purchase as a digital download. Chapter 1: Just how quickly? Chapter 2: When is a crash diet appropriate? The following is an excerpt from Chapter 1: Just How Quickly? On average, caloric intakes on this diet will come out to between 400 to 1200 calories per day coming almost exclusively from protein. For those of you familiar with ketogenic (low- carbohydrate, high-fat) diets, a PSMF is essentially a ketogenic diet without the dietary fat. Obviously, this will represent a fairly large caloric deficit; how large depending on your starting body weight and activity levels. So with all of that in mind, you may still be wondering what you can expect in terms of true fat loss per week. A lot of it, actually, will depend on where you’re starting out body weight wise (activity also factors in), as that determines your maintenance caloric level. A 165-pound male with normal activity patterns may have a maintenance requirement of about 2700 calories per day. At 800 calories per day on this diet, that’s almost a 2000 calorie per day deficit, 14,000 calories over a week, 28,000 calories over 2 weeks (note there is a slowing of metabolic rat that reduces these values somewhat). Assuming all of the true (non-water) weight lost was fat (it won’t be), that should be an 8-pound fat loss in 2 weeks (28,000 / 3,500 = 8 pounds) or approximately 2/3rd of a pound of fat lost per day. The true fat loss will be lower because of various inefficiencies and the slowdown of metabolic rate (which can start after only 3-4 days of severe caloric restriction). deficit. Over 2 weeks, that’s a 42,000-calorie deficit, divided by 3,500 calories per pound of fat equals 12 pounds of fat. That’s on top of the 10 or more pounds of water that may be lost. Females or lighter individuals with their generally lower maintenance caloric requirements will lose less. True fat losses of 1/2 pound per day or slightly less may be all that they get: that still amounts to a considerable fat loss (6-7 pounds true fat loss over 2 weeks) along with the extra water weight loss. 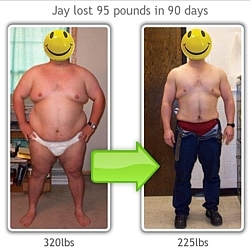 If a picture is worth a thousand words, then Jay’s before and after pictures here should tell you everything you need to know. “I’ve been lifting weights for 35 years, been in the medical field for 20 years, have been a critical care nurse for 12 years. I am well aware of the nutritional needs of humans, and nearly every theory of dieting ever advanced. I’ve done most every type of diet. I have never had such an easy time losing so much fat with so little muscle loss in such a short period of time (50 pounds in 2 1/2 months) as I have with Lyle’s PSMF. “I put a world class BJJ (brown belt) athlete on a modified RFL diet about 3 weeks before the Pan American games 30 March in Los Angeles. He’s my coach’s son. I synopsized the diet for him so it was easy-to-read, is all. He called in a panic 3 weeks out because the Pan American games were approaching and he was still 4# over weight and hadn’t been able to lose it on his own. The guy was very lean already so it’s a tricky situation but he pulled it off. March 30th he won the gold medal in his weight class. He weighed in 1# below weight, he looked and felt great and fought like a freak. Back to the kid, now his own BJJ coach (who also competes and also won gold 30 March in the Masters black belt division) sent word that in observing how well Zak performed on the diet and going on to win the Pan Ams that he wants to do it as well to drop a little weight for the upcoming BJJ World’s tournament the first week of June. “Looking for a fast and easy way to lose weight? There are plenty of so-called crash diets, but only one diet rooted in science and physiology allows you to do so safely without losing precious muscle mass and slowing down your metabolism – the Protein Sparing Modified Fast (PSMF). In The Rapid Fat Loss Handbook, Lyle McDonald has distilled this method with decades of research behind it into practical guidelines, with easy-to-understand categories depending on your starting point in bodyfat, weight and fitness level. The Rapid Fat Loss Handbook comes in a variety of formats which has caused some confusion. All versions of the product come with digital downloads of the Home Exercise Handbook and the Calculator instructions. The PDF only version comes with the PDF version of the The Rapid Fat Loss Handbook along with the additional files. The Kindle only version comes with a single Kindle file containing all three files. The Hardcopy bundle comes with a physical copy of the book and the two digital files. The Hardcopy + PDF bundle comes with a physical copy of the book along with the PDF version of the main book and the two digital files. The Hardcopy + Kindle bundle comes with a physical copy of the book along with the Kindle version of the main book (which includes the Home Exercise Handbook and Calculator instructions). The Rapid Fat Loss Handbook can also be purchased as part of a Complete Rapid Fat Loss Program (link will take you to an external site) including The Rapid Fat Loss Handbook itself, A Guide to Flexible Dieting, The Home Exercise Handbook, a Home Exercise Handbook Video library, and the Calculator instructions. If you are confused over which version to order, please feel free to email me directly.